You’ve probably never heard of C.J. Pine. This is a shame, because he is a remarkable young man. Notre Dame is a place that holds tradition dear. One such tradition is to extend an invitation to newly elected presidents to speak at their commencement. I remember the buzz when we welcomed President Obama in 2009. Other graduates have been addressed by Presidents Eisenhower, Carter, Reagan, Bush the Elder, and Bush the Younger. These invitations were originally intended to honor the country’s new president. But in recent years, this old Notre Dame tradition has started to be read as a referendum on Catholic identity. I remember vividly what it was like when President Obama came to speak in 2009. I remember a plane flying low over campus with a shocking image of an aborted fetus. I remember several graduates taping yellow crosses and images of baby feet to their mortarboards. I remember hearing people in the crowd yelling out “baby killer,” “abortion is murder,” and “you have blood on your hands” during Obama’s speech. Most of all, I remember feeling sorry for the graduates. In several conversations with my classmates (I was a junior), all of us seemed to be grateful that that this wasn’t our commencement year. This weekend is supposed to be about celebrating them, we agreed. Jenkins invited Vice President Pence as a compromise. It was his effort to navigate the tension between respect for the White House and keeping the focus on graduates. You can tell by my google-search results whether his efforts were met with success. Predictably, the walkout was praised by the left, and blasted by the right. 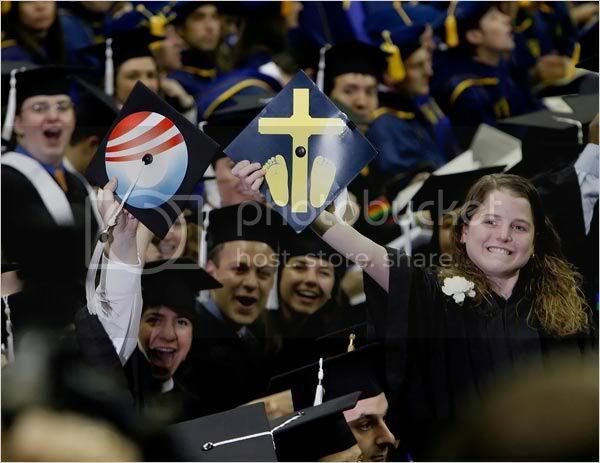 Even more predictably, celebrating the graduates took a backseat to a clash of ideologies. Watching the video of the walkout on Sunday brought with it a familiar feeling of frustration. It felt like 2009 all over again. Rather than focusing on the accomplishments of the graduates, we were settling into the familiar space of ideological squabbles. Initially my frustration was directed at the protesters. Their action seemed to me to be selfish. How are they so willing to make this event about their own opinions rather than the good of the whole community? I have plenty of problems with Pence’s policies too, but I don’t think this the time or the place. But those were just my initial reactions. And as these feelings subsided I began to wonder about these reactions. Maybe I was wrong, maybe they were doing this not for themselves, but for the community. And then it dawned on me: had anyone bothered to ask them why they walked out? I hopped back on Google to investigate, looking for in depth interviews with the protesters – anything more than a one-line pull quote. Nothing. There were dozens of reports hailing the spectacle: 100 students walk out on Pence! they read. But nothing from the actors themselves. I was disappointed that these reports were all about “the optics” of the walkout, with nothing done to investigate the spirits that motivated it. In my frustration, I made an assumption: that the protesters were trying to make a statement. I interpreted their walking out as the equivalent of “I don’t like Pence,” or “I don’t agree with some of Pence’s ideas.” Under this interpretation, I reasoned, my frustration with the protesters would be valid. We live in a sinful, broken world. Consensus about truth in our contemporary pluralistic context is not possible. Walking out on Pence due to a personal disagreement about values or beliefs is incoherent. But what if the protesters walked out for a different reason- out of a deep sense of solidarity with the poor and vulnerable? With our LGBTQIA brothers and sisters who have suffered from suggestions by Pence and others that they need “conversion therapy?” With immigrants and refugees whose current livelihood is in peril due to policies advanced by the current administration? What if walking out was less about the protesters turning their back on the Pence the man (or his ideas), and more about sending a message to people on the margins of our society: we’re with you. We won’t accept anything or anyone that treats you as less than the divinely-created, beautiful human beings that you are. Unfortunately, I have no idea what the protesters intended to mean by their walkout on Sunday, because no one seems to have bothered to ask them. My biggest problem with what happened at Notre Dame on Sunday is not that protesters decided to walk out during Pence’s speech. It’s that we quickly resorted to ideological camps to laud or criticize the protesters, without taking the time to ask them what they meant by walking out. In so doing, we nearly missed an opportunity to encounter and understand those with whom we disagree. Thankfully, there was another person on Sunday’s stage who modeled exactly what I hoped to see, and he did it by showing us of the power of kinship and encounter: Father Greg Boyle, SJ. Boyle was at the commencement to receive the Laetare Medal, widely considered to be the highest honor that can be bestowed upon an American Catholic. Like Pine, Boyle’s honor was accompanied by the expectation of a speech. In his speech, Boyle did not directly address the actions of the protesters. What he did do is pay attention to a particular person: his friend, former gang member Jose. He recounted, with tears, Jose’s painful history of being orphaned at an age nine by a mother who did not want him. How he wore three shirts to school to hide the blood and wounds inflicted on him by adult abusers.